Today's day started off with an early breakfast at 8 o'clock serving eggs, bacon, potatoes, fruits, muffins, and cereals. Drinks included orange juice, apple juice, and water. After breakfast we got on our assigned buses and went to look at Hidden Gems for an hour where we saw statues of various lesser known people. 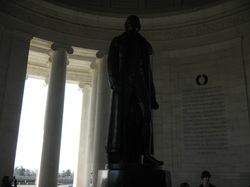 At 10:15 we left to go to the Jefferson Memorial where we got to see quotes by Thomas Jefferson himself. We then had to choose which one was our favorite; "we hold these truth to be self evident, that all men are created equal." 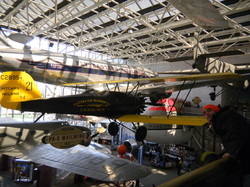 At 11:30, everyone went to the Smithsonian National Air & Space Museum to have lunch. At the museum we saw many robotic things like cars and also models of rockets all around. 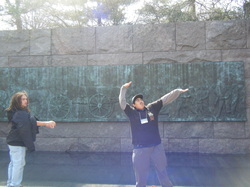 After lunch and a unguided tour around the museum, everyone went to the Franklin Delano Roosevelt Memorial. There we saw statues of men and women in a breadline. At 2:30 we went to the Inside Washington Seminar where we got to talk to Frank Smyth, a journalist who was put in jail in Iraq. Later at four we went on a Washington Neighborhood study visit where our group got to explore Dupont Circle for two hours. We then got back to our hotel at 6:30 and ate dinner and rested for half an hour. At 7:15 we got into our groups and discussed domestic issues such as gay marriage, oil dependency, social security, healthcare, deficit. We also got into groups of four where we made up our own country, made its rules, and auctioned off our country's rights. The last thing of the day was our whole group debate meeting where we listened to two guys discuss opposing sides of the domestic issues.